I’m as big a college basketball fan as the next guy. When March rolls around, I’m glued to the television set, incorrect brackets strewn across my living room. I yearn for the analysis of Clark Kellogg and the soothing sounds of Verne Lundquist and Bill Raftery. But is it really necessary for ESPN to already start bombarding us with Joe Lunardi’s Bracketology in mid-November? College football is in full swing and we only recently started talking about bowl assignments. The last thing I want to hear a mere two games into the basketball season is how Jojo projects Butler as a lock for the Midwest’s fourth seed. 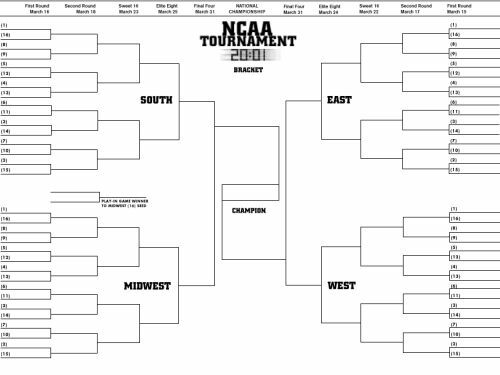 The ONLY good that can come out of discussing college basketball’s postseason this early is the hope that the BCS will incorporate a similar playoff format. But we all know it won’t happen in our lifetimes. So what’s the point? Last Monday, we were witness to the coaching decision heard ‘round the world. Up by six with two minutes to go, Bill Belichick of the New England Patriots opted to go for it on fourth-and-two rather than punt the ball from his own 29-yard line. The problem is they didn’t get those two yards and gave Indy the ball back a mere hop, skip and jump from the end zone. The Colts scored seconds later for the victory. It was the talk of the day, if not the week. Coaches, players and analysts nationwide initially bashed Bill for this call. Then an odd thing happened. The following morning, people suddenly found logic in his decision. Many justified the move, commending Belichick’s trust in his offense enough to get the two yards. They called him bold and unconventional. They showed that, by the percentages, Belichick actually made the right call. I’m not exactly sure what numbers they were looking at. Punting in that situation is essentially a football no-brainer. While the statistics over the years may prove that Belichick’s Patriots have one of the highest 4th down conversion percentage in the league, they probably don’t account for the times he went for it deep in his own territory up by a touchdown. Bill Simmons accurately pointed out that, although the Colts already had two touchdown drives in that final quarter, the amount of teams that have THREE touchdown drives in a fourth quarter over the past few years is minimal. Few coaches have ever made the call Belichick made. Even fewer have done it up by six. But the Hoodie gambled and lost. He defended his move, saying he thought his offense could get the first down then run out the clock for the win. That didn’t happen. I guess when you have three Super Bowl rings, you’re allowed a few minor indiscretions. Malice at the Palace: Where were you? Most fans can tell you exactly where they were when certain historical sports events took place. When Magic Johnson admitted to contracting the HIV virus, I was in grad school, wasting away time playing video games on my computer. I heard the news on the radio. When a baseball trickled through Bill Buckner’s legs, allowing Ray Knight to score the game winning run in the 1986 World Series, I was fighting back the tears as a freshman in my college dorm room. When Ron Artest charged into the stands at Auburn Hills after a fan threw a beer on him, I was watching the game at Godzilla Richie’s house. He and I actually had a wager on that game, but thoughts of our three-teamer quickly flew out the window as we watched Artest and Stephen Jackson beat the tar out of a fan in the stands. I remember staying up all night that night, watching lowlight after lowlight of that event. It was something the likes of which I had never seen before at a professional sporting event, probably because I don’t watch much European or Central American soccer. After the melee, Commissioner Stern laid down a heavy hand, suspending Artest for a full season. Jackson was suspended for thirty games. Seven other players were suspended in what was the NBA’s lowest moment since Kermit Washington broke Rudy Tomjanovich’s jaw. Last week commemorated the five-year anniversary of that moment. Piston season ticketholder John Green, who threw the beverage to start the brawl, and a kinder, gentler Artest have since banded together to see what good can come out of the incident. No word on whether they landed Sting or Bono for the album. Football coaches these days are unfortunately measured by only two things: wins and losses. Somewhere along the line, we lost sight of the importance of graduation rates or molding tomorrow’s adults. This past year has been littered with coaches setting improper examples for those they’re supposed to mentor. Rick Pitino had an extramarital affair in an Italian restaurant. Tim Floyd, John Calipari and Rich Rodriguez all had their names linked to NCAA violations in one form or another. Now we have Mark Mangino who’s recent comments make Bobby Knight look like a choirboy. The current, and likely soon to be ousted, head football coach of the Kansas Jayhawks is being investigated for inappropriate verbal and physical behavior against his students. The most despicable of these are comments he allegedly directed at a former player who’s brother had just been shot. Wow, there are so many things wrong with that statement, I don’t know where to begin. Look, I’m all for disciplining student athletes and teaching them right from wrong. It’s an integral part of college athletics. But there’s a fine line between discipline and cruelty. Urban Meyer, Pete Carroll and Nick Saban all walk that line successfully while not denigrating their players. They also manage to mix in a sit-up or two. Mangino built the Kansas program but if these and other allegations are true, Mangino should be shown the way out of Lawrence. He might want to introduce himself to a salad bar on the way out. This entry was posted in Card Table, Hardwood, Life of Sports Chump, Music, Pigskin, Screen and tagged Bill Belichick, Chumpservations, College Basketball, David Stern, Indianapolis Colts, Joe Lunardi, Kansas Jayhawks, Mark Mangino, NBA, Ron Artest by Chris Humpherys. Bookmark the permalink. Mark Mangino , what’s he done now ? Ate one of his players ? LOL,LOL,LOL !!! Though I’m not upset with Bilbo Baggins. I was somewhat perturbed by his decision in the game against the Colts. But you know, you win some , you lose some. And over the last decade the Pats’ve won more than they’ve lost. 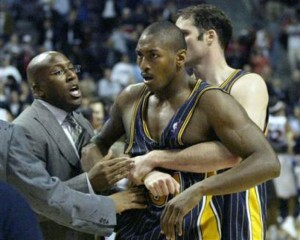 So Artest got into a fight at the Palace of Auburn Hills. Who hasn’t wanted to throw down during a game ? Look it’s not as if he’d attacked an old lady in the stands now is it ? It was just some punk who questioned his birthright and who said that his game sucked . What’s wrong with that ? LOL,LOL,LOL !!! I’m sure that there’ve been times when you’ve no doubt questioned a player’s birthright and his so called game ? Be honest Sportschump you gotta keep it real man ! Thanks for chiming in on the AI , T-Mac piece ! Need to pull my Mookie Wilson jersey out of the basement. 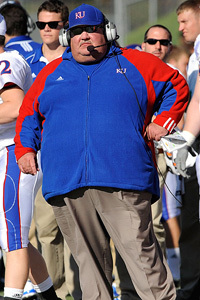 Re: Mangino, it sure looks like it. How’s he going to walk into living rooms and recruit kids after he just trashed the way some parents raise their kids? All’s quiet on the Mangino front after their blowout loss to Texas. I wonder if they’re still investigating matters. I just don’t see how Belichick’s call was in any way the right one. If you put it that way, Artest sounds like he was in the right. Clearly Green had no right to throw a beer at him. He got what he deserved. Apparently he served 30 days in the joint and was mandated to take anger management classes. Don’t think he ran into Mangino there. You might want to, Donny C, considering the Mets haven’t seen glory since. If Green ran into Mangino at anger management counseling . I can only surmise that they didn’t share ideas on what is proper public etiquette ? When is it appropriate to say ‘_*k you’ and ‘I’ll f_*k your mother if you don’t watch out’ ? I just hope that former Nets’ star gets his salad tossed while he’s in prison ! Dropped this ditty on NFL Week 11. NFL Weekend 11 Results And Its Aftermath …….. Boys With Tattoos (We Jerkin’) ? As the girlfriend is considerably younger than myself . She was under the impression I couldn’t hold my own when we hit a party on Friday at her one of her friend’s homes. To’ the roof of that sucka ! There’s still plenty of heat once the bellows get stoked. So that’s what Mark Mangino looks like. I always wondered what ever became of Flounder from Animal House. So is Green Adam Sandler and Mangino Jack Nicholson (plus 200 lbs)? Al, thanks for the invite. Let’s just say that “We Jerkin'” is currently not on my iPod. Snake going all National Lampoon on us. Nice. Let me know when you start growing those Marquis Daniels dreads. Great piece by PUTS ! I’ve got that on the girl’s I-pod. But as of late I’ve been heavily listening to a great deal of jazz. If you check out my latest piece , you’ll see I’ve been listening to some Miles Davis, Charlie Mingus and Herbie Hancock. Are the spate of concussions now being suffered by several major NFL players gone out of whack or what ? We’ve had Portis, Westbrook , Roethlisberger and several others as of late. Some of those hits have been innocuous , while others have been blatant. There now has to be more down to safe guard the players before someone ends being killed on the field of play. It’s already happened at the high school and college level this year alone. So if anyone doesn’t think it possible in the NFL. Then they’d better start to rethink that whole issue retrospectively. Cause an injury of that magnitude is just waiting around the corner for an NFL player. And God knows what’d happen were it to be one of the marquee players in the NFL. I’ve read far too many asinine statements by individuals saying that the league has gone soft. The players now are bigger, stronger and a damn lot quicker than those of yesteryear. So the likes of Deacon Jones just ought to shut the _*ck up once and for all ! It’s merely jealousy on his part because today’s NFL players are being more richly rewarded than those from his heydays in the league. Nothin’ wrong with a little Blue Note, Al. I went through that period myself and still have a bunch in my collection. Among the best album cover art ever. Yeah, man. PUTS is the groove. That’s pretty much all I listen to these days… other than sports radio, of course. With each concussion, the NFL faces an even bigger headache, pun intended. I don’t know what the league can do. It’s a physical game. The problem with the stats and percentages on that Belichick call is that Peyton Manning was on the other side. That changes the equation, fo sho! Three years ago Belicjick was in the same situation late in the 4th quarter of the AFC championship game. That time, he punted the ball. The other team took it 60 yards in less than a minute, scored the game winning TD, and went on to win the SB. Guess who that QB was. I believe this time Belichick was hoping his defense would let Peyton score quickly, and have some time left for the Pats’ offense. Regarding Mangino….I wouldn’t believe everything a disgruntled former player(s) says about a coach. His won/loss record will affect his dismissal a lot more than a player’s hurt feelings will. KU’s lawyers are probably looking for a way to not pay any buyout money to Mangino based on some hostile work environment clause. Han… I don’t know that there’s really ever a logic to allowing a team to score. I also don’t know that there’s ever a logic in punting when up by six from your own 29. If you don’t trust your defense enough to stop even the best QB in the league from leading his team down the field, then it’s time to revamp your d.
Han, I’m sure there’s more to the Mangino case than meets the eye. I wasn’t casting aspersions. And his current record isn’t helping matters. The former athlete may have been lying. But he might not have been. All I’m saying is…. if those comments are true, then actions need to be taken. Until the NFL is actually proactive on this issue. There’ll continue to be not only the injuries but a real danger that a player could end up dying on the field of play. And were it to happen to someone of the say the likes of Manning, Brady , Roethlisberger or some other high profiled player. What do you think that they and unions would be then saying ? Oh it goes with the territory – …. I think not ! I see that Raheem has taken of the defensive coordinator position and calling duties now ? He’s sent him Jim Bates to the boys’ room . LOL,LOL,LOL !!!! What the hell was Kubiak thinking last night ? And boy who knew that Vince Young would have the balls to lead the Titans to four straight victories ? 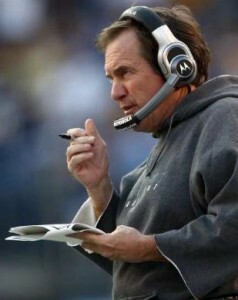 I agree with you about Belichick’s decision. He should have punted and put a little faith in his defense. Who knows he may need them this winter. I made a comment that if Mangino’s record was better he wouldn’t be getting the critizism that he is receiving. That was before I read what was actually said. The man should find another line of work, perhaps conservative talk radio. The real logic is preventing the opposition from scoring. That’s all there is to it ! How much worse is it going to get for the New Jersey Nets ? 0-13 and counting…one Mississippi ,two Mississippi, three Mississippi, four Mississippi. Stop me when you’ve heard enough . Dropped this piece on them and their present predicament. One Man Doesn’t A Team Make So Here’s Looking At You Kid …..
Al… Big Ben’s already had his bell rung. Again, it’s a violent sport and I’m not sure what the league can do to protect its players more than it already has. The Bucs are a mess, man. That Saints game should have given the organization a good idea of how far they need to go to become one of the best teams in the league. Hopefully, they were paying attention. I don’t think Brees had any dirt on his jersey. Aer… Nice. I think you found Mangino’s calling. Al… maybe the Nets should bring Byron Scott back after all. Only a matter of time before Frank’s gone. Like any of this is his fault. He’s still their coach, isn’t he? There’s a lot that the NFL can do but they choose not to because of the financial implication to its members. But that’s another story for a different day. After last night’s display by the Titans’ Vince Young and Chris Johnson. Who can deny the Titans’ their right to have their moment on stage ? That’s now 4 straight wins with Young at the helm. They can’t be missing Kerry Collins can they ? When I Was A Child I Spake As A Child I Understood As A Child I Thought As A Child But When I Became A Man I Put Away Childish Things …..
And it would appear so too has Vince Young . Al… if the league doesn’t protect its players, who will it have left? I trust they’re doing everything possible to do so. Just not its vets. I can’t think of anyone unhappy to see Vince Young return to form. Now can he lead Tennessee to the post-season? It’s got to tell you something when the top two medical advisors that the NFL had re-signed in disagreement with the studies put forth by the AMA, AJM and several other neurological submitted to the NFL for their perusal. And now Goodell is trying to act as if he’d always had the players’ best interest at heart ? He’s merely paying lip service to the issue much like his predecessor had done on this issue as well as that the players’ health benefits. So will you be adorning your self with Tebow eye-black when the Gators take it to the ‘noles this weekend ? Left you a response with regard to the comment on my piece about NFL Week 11. Also Eva’s waiting to say hi . NFL Weekend Week 11 Results And Its Aftermath ..
Tebow eye black to hold back the tears, brother, something Coach Meyer was obviously unable to do. He’s channeling his inner Rex Ryan.